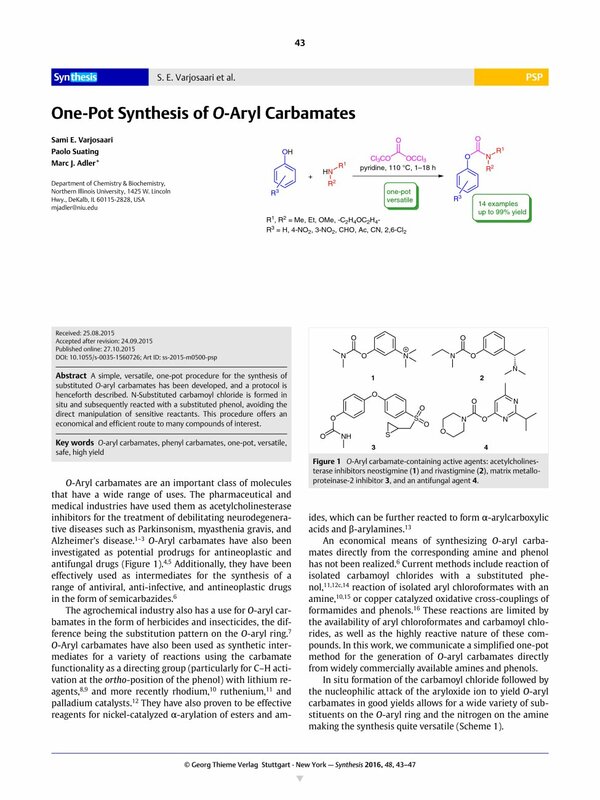 A simple, versatile, one-pot procedure for the synthesis of substituted O-aryl carbamates has been developed, and a protocol is henceforth described. N-Substituted carbamoyl chloride is formed in situ and subsequently reacted with a substituted phenol, avoiding the direct manipulation of sensitive reactants. This procedure offers an economical and efficient route to many compounds of interest. 3 Murillo Garrido JV, Armengol Montserrat M, Martín Juárez J. ES. Pat. Appl PCT/ES2006/000459, 2006 , Chem. Abstr. 2007, 146, 206113.